A range-restricted species (EOO 3715 km²), currently known from 10 locations but probably occurring at a few more, that is declining due to ongoing habitat loss and competition from alien invasive plants. Saldanha Bay to the Cape Flats and Hermanus. Deep, calcareous sand in strandveld thicket. This species has declined and is now possibly locally extinct on the Cape Flats due to habitat loss to urban expansion. Along the Cape West Coast, it continues to decline due to habitat loss to coastal development, agriculture, as well as competition from unmanaged alien invasive plants. South of the Cape Flats it has been recorded only once, in an area undergoing extensive coastal development, and it is uncertain whether any plants survive. Manning, J.C. and Goldblatt, P. 2012. 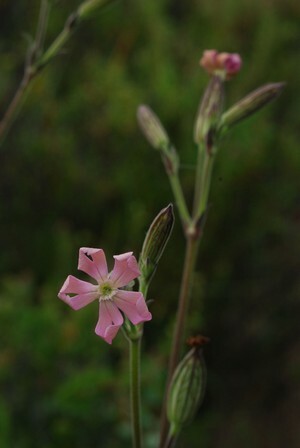 A taxonomic revision of the southern African native and naturalized species of Silene L. (Caryophyllaceae). Bothalia 42(2):147-186.